Do you need a place to relax in the outdoors? A place where you can just sit down after a hard day's work and enjoy the fresh air outdoors? Then perhaps the addition of a patio is the answer for you. A patio is normally a paved or concreted area with a roof. This enables you to sit outside no matter how much sunshine there may be; you will still be protected and able to enjoy the outdoors. Let us turn your outdoor living space into a perfect relaxation haven by installing a new patio. Preferred Landscape has been providing patio design and installation services to our clients through greater Louisville, Kentucky for many years. Our teams of professional paving contractors have all the experience and expertise to give you a beautiful paver patio. The addition of a patio to a residential or commercial property has become a very popular landscaping project. The reason for this is that it comes with so many benefits. Not only will you have a place to relax but you will also have a place to entertain family and friends. It will also increase the aesthetic appeal of your outdoor areas and thus also increase the value of your home or business property. What a patio does is increase the amount of living space you have into the outdoors. Just another reason why a patio can really make a huge impact to the function as well as the appeal. A patio really is one of the best renovations one can make to their property! 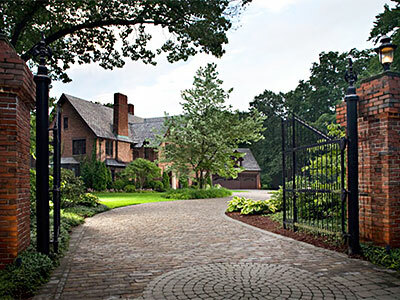 We at Preferred Landscape highly recommend the use of paving stones. Pavers are available in a wide range of material types. They are also available in an array of colors, shapes, sizes and textures. The design opportunities with paver's are endless; we can create a unique paver patio for you. With such a large range of pavers on the market there is bound to be something that will suite your property and your budget. We believe that paving stones are a lot more economical in the long run. They are easy to install and very easy to maintain and repair. 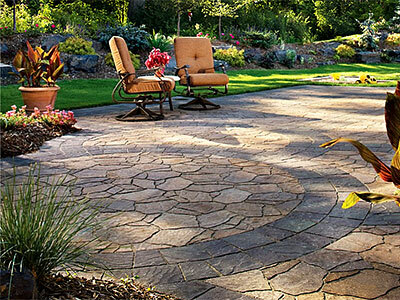 Damaged or cracked pavers can simply be pulled up and replaced with new pavers. Whereas, if you have a stamped concrete patio, the cost of repairing cracks is much more labor intensive and much more expensive. Preferred Landscape will design and install a patio that is ideal for your property. Our designers and contractors will sit down with you and help you make all the right decisions when it comes to materials and products for your new patio. You will be delighted with our paving work. We pride ourselves on leaving our client 100% satisfied with their new paver patio. Foe at Preferred Landscape we realize that it is your satisfaction that maintains our success in the industry. So contact us today and we will give you a free consultation and get you one step closer to having the patio of your dreams!